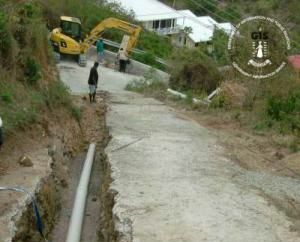 ROAD TOWN, Tortola, VI - The Government of the Virgin Islands remains committed to completing the National Sewerage Project. As such, it is inviting tenders for the replacement of the sewerage system pipelines in Parham Town to Chapel area of East End, Tortola. The proposed work consists of furnishing all plant, labour and equipment, installing materials supplied by the client and performing all operations in connection with the replacement of sewerage pipelines in the Parham Town to Chapel Hill area of East End, Tortola, in accordance with the drawings and specifications and Tender Documents. In addition, this project includes undertaking sundry works, including the site investigation to locate underground utilities, all excavation, backfilling and disposal, installing shoring equipment, dewatering, testing of the works and reinstating roadway and pavement. According to the Director of Communications Mrs. Arliene T. Penn, the sewerage solution is one of the highest priorities of Government as it continues to work towards improving the public infrastructure and building a better Virgin Islands. Interested tenderers are required to submit certificates of good standing from the Director of the Social Security Board, the Commissioner of Inland Revenue and the Registrar of Corporate Affairs and a valid trade license. The issue date on the certificates should be no earlier than one month prior to the date of submission. Tender documents are available upon request from the Chairman of the Central Tenders Board in the Procurement Unit of the Ministry of Finance and will be distributed from Monday, June 3 to Friday, June 21, 2013 from 9:00 a.m. to 4:00 p.m. Upon collection of the tender document, a non-refundable $250.00 fee is payable to the Accountant General by way of cash or cashier’s cheque. The deadline for the submission of tenders is Tuesday, July 23 no later than 10:00 a.m.
Tenders will be publicly opened on Tuesday, July 23, 2013 at the Ministry of Finance, Procurement Unit located in the Rita Frett Georges Building (RFG) on the third floor beginning at noon. For more information, interested persons can telephone the Procurement Coordinator Mrs. Ishma Rhymer at the Procurement Unit at 468-3701 ext. 4243 or 4244. Government remains committed to completing the sewerage system in Long Look / East End, Road Town and its environ while enhancing the Territory’s public infrastructure.